Community Neuroscience Services (CNS) is an innovative neurology practice dedicated to treating the whole patient and to provide a comprehensive community of care where patients feel respected and valued. CNS had a very old, static website and came to us looking for something fresh and new. Their goal for the website was to be a valuable source of information for people with neurological disease. Potential Clients come to CNS looking for information on doctors who will be able to treat their problem and make them better. 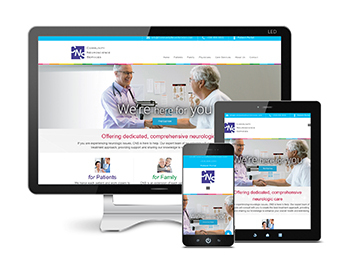 We provided CNS with a completely new website layout which breaks down the site into their three target audiences: patients, families, and physicians. The site also highlights what services CNS offers their patients and biographies of the medical staff involved. The site also includes a link to a Patient Portal where clients can communicate with their physician’s office 24 hours a day, 7 days a week. The new website is a fresh, well-organized website that users can easily browse for information on neurological diseases and treatments. In just 3 months, CNS went from not being listed in Google’s 10-pack of local results for the keyword of ‘neurologists in Worchester, MA’ to being the top listed result. CNS has attributed their growing customer base to their Local SEO campaign.